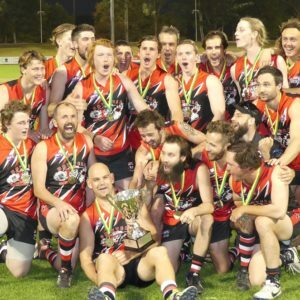 Sawtell Toormina Saints have bounced back from the disappointment of losing last year’s Grand Final to pass the first milestone on their path to redemption by securing the Minor Premiership in the Senior Men’s grade. The Saints sealed top spot on the ladder with an away from home, 41 point victory over Port Macquarie Magpies. Consistency was the key to the Saints performance, scoring a minimum of four goals in each quarter. Mitch Napier has been the Saints leading goal kicker this season and he was again the main avenue to goal with five majors. Napier received excellent support inside the forward 50 from Jordan Perks, Brandt Lee, and Jimmy Angel who each contributed three goals. This match was indicative of the Magpies’ season, where they competed strongly for three quarters but couldn’t match the Saints intensity for the duration. 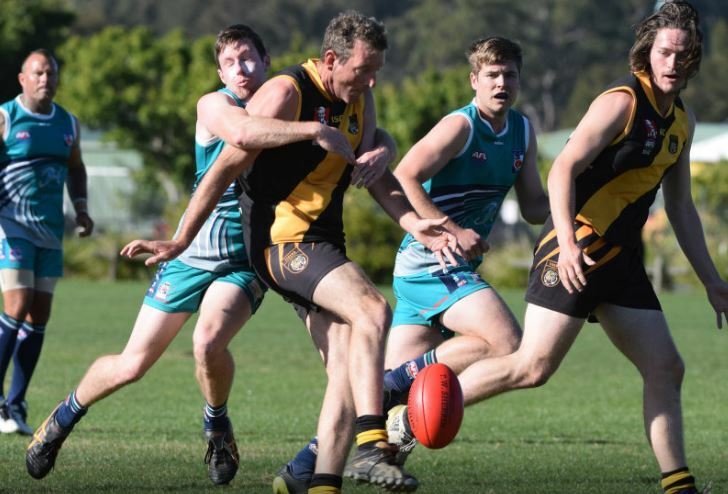 Port held a narrow three point lead at the first break and only trailed by seven points at half time, but could only muster one goal in the third term against Sawtell’s five. Just as was the case for Sawtell, Port’s leading goal kicker Sam Johnson added five goals to his season tally. Key differences in the outcome of the match was that Port only had two other players to kick multiple goals in Fraser Carroll and Tom Marmo, and they could each only contribute two majors. The Grafton Tigers season has run out of steam and the last thing they needed was to come up against the competition’s in-form team in the Coffs Harbour Breakers. Missing key players in Luke Stanford, Ethan Olsen, Callan Obst, and Lachie Glover the Tigers knew they were going to be up against it, but didn’t anticipate the intensity at which Breakers would launch into the match. If the match wasn’t all over by quarter time when Breakers held a seven goal lead, it certainly was by the long break when Breakers had blown the lead out to 18 goals. The outgunned Tigers battled on manfully and produced their most significant output of the match in each of the last two quarters but were powerless to stop the hemorrhaging of goals at the other end. Nick Stanlan-Velt had a field day, kicking 14 goals for the Breakers and dishing off at least a couple of others to team mates. Further misery was piled onto the Tigers by Shaydan Close and Brett Vella with five goals apiece, while Jacob Sincock added three. Doug Perich was the only multiple goal kicker for the Tigers with two. Kieran Francis, Chris Curthoys, and Travis Kopp each added one goal on a long day for the Tigers. In the Women’s match between Port Macquarie Magpies and Sawtell Toormina Saints it was a case of no Keira Basset for Sawtell, no worries! In the absence of the competition’s leading goal kicker Kacee Uikelotu stepped up and booted six majors, trebling her season tally in one fell swoop. An opening quarter blitz by the Saints set them on the path to victory as they held a 21 point lead at the first break. By the time that Port had registered their first goal of the match in the second quarter the Saints had added a further two to extend the lead to 27 points at half time. 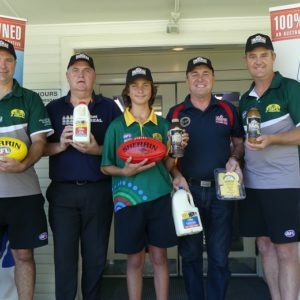 The third quarter saw the Saints add two goals against just one behind for Port and, whilst the Magpies rallied to lead the scoring in the last term, the result was beyond them. Alana Hanson and Vienna Schoeffel played the support act to Uikelotu with a goal each. For the Magpies, Tyisha Duke-Holten lead the scoring with two goals and Megan Cooper kicked one.